Taufkirchen, December, 2016: Airbus received the Federal Ecodesign Award for its innovative Bionic Partition design concept from Maria Krautzberger, President of the Federal Environment Agency. APWorks produced the part for Airbus using additive manufacturing. The Bionic Partition divides the seating area and the galley of an airplane. The challenges in making it were to include a cutout for emergency stretcher access and a fold down seat for cabin attendants. The engineers successfully implemented those requirements in the new design. The result is a product that weighs 45 percent less than conventional partitions due to design optimization and the use of Scalmalloy®. The weight reduction results in fuel savings and reductions in CO2 emissions of ten tons per aircraft per annum. Thanks to additive manufacturing and a modular structure, the partition can be installed in existing aircraft cabins. If required, individual components can be easily replaced. Furthermore, the material used is completely recyclable. These were reasons enough to receive the Ecodesign Award. 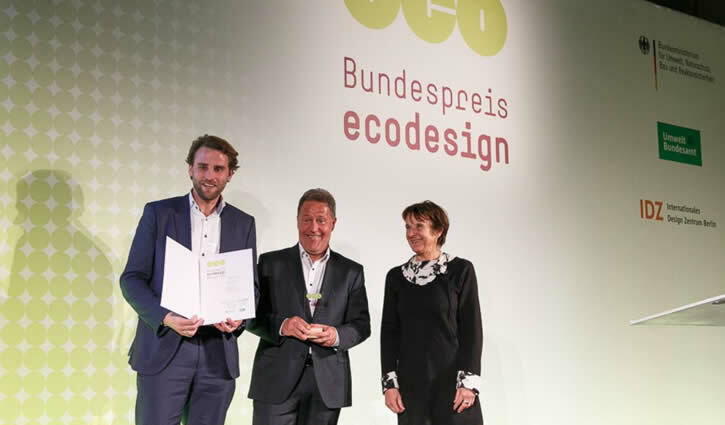 Since 2012, the German Federal Ecodesign Award has been granted annually by the Federal Environment Ministry (BMUB) and the Federal Environment Agency (UBA) in cooperation with the International Design Center Berlin (IDZ). The Ecodesign Award recognizes and honors pioneers in the field of ecological design. The Bionic Partition was designed in a collaboration between Airbus and Autodesk. APWorks produced the parts of Scalmalloy®, an aluminum alloy specifically developed for 3D printing. Scalmalloy® is a corrosion resistant aluminum alloy that is virtually as strong as titanium. Specifically developed for additive manufacturing, the material combines high strength with an extraordinary level of ductility, making it the ideal material for parts in high demand for applications such as robotics, automotive, and aerospace. By comparison the aluminum silicon powder AISi10Mg, which is very popular for ALM applications, is only half as strong. Besides Scalmalloy®’s excellent strength properties, its high level of ductility gives it a distinct advantage for safety-critical applications. This entry was posted in News and tagged Additive Manufacturing, Airbus, Airbus APWorks GmbH, Autodesk, Bionic Partition design concept, Design Center Berlin, Ecodesign Award, Federal Ecodesign Award, Federal Environment Agency, Federal Environment Ministry, German Federal Ecodesign Award, German Society for Design Theory and Research DGTF, Maria Krautzberger, Professor Matthias Held, Scalmalloy®, School of Design Schwäbisch Gmünd by AM. Bookmark the permalink.